Big Mill B&B birds need special foods in the cold winter. 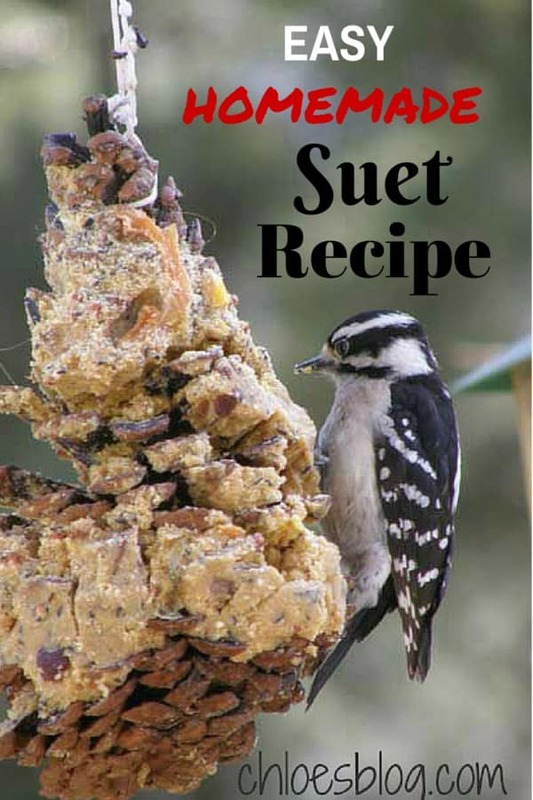 I was snowed in so I created this easy, new Suet Recipe with foods I had on hand in the pantry. The birds LOVE it! And children love helping you make it. There are two items you really need: grease (either lard, bacon fat or any meat renderings) and peanut butter. All the other ingredients are optional. 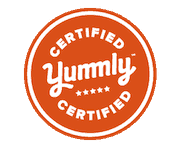 The Old Farmers Almanac suggests that we use any seed or grain mixed with bacon fat or lard and peanut butter. That is a good basis and then I add whatever I can find in the pantry. I have added dried coconut, corn meal, dried cranberries, fresh blueberries, oatmeal, any nuts and any dried fruit and even grits. The idea is to make it stick together. Sometimes I roll the stuffed pine cone in ground up nuts or seeds. If you are missing ingredients, make it anyway just as long as it sticks together. The only musts are the lard or fat and the peanut butter. My birds seem to love it all! This recipe is one that can use lots of substitutions so you don’t have to go to the store. 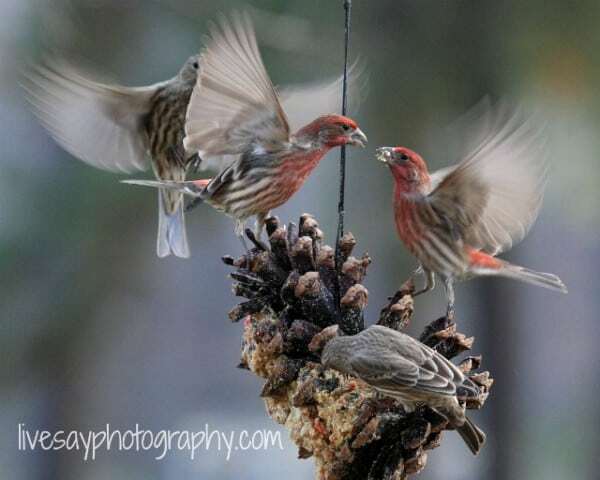 Of course, I didn’t have all the ingredients that my Big Mill Innkeeper’s Suet Recipe called for, so I just made up this suet recipe and the birds LOVE it. Growing up on a farm and living on a boat, I am used to substituting. 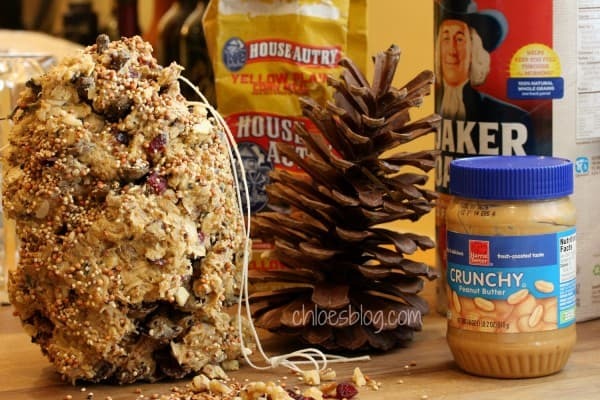 Make Suet at home from items you have in your pantry. Mix all of these ingredients together. If it is crumbly, you can add more lard, peanut butter or even honey. If it is too gooey, add more cornmeal, oats or flour. 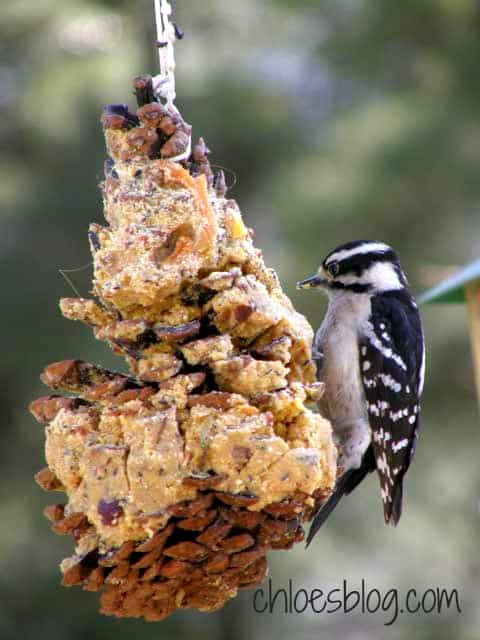 Press the suet into a pine cone, tie a string around the cone and hang in a tree. Children love to do this. If you are in a real pinch you can use just peanut butter. The birds will love you! Woodpeckers seem to like this especially if you add coconut.